Older leaky buildings permitted sufficient air change (fresh air infiltration) to remove pollutants (such as carbon dioxide, moisture, mold spores, formaldehyde from building products) by the natural forces of wind and stack effect. Newer, tightly built homes do not allow this air exchange. The best way to introduce fresh air into a home is through the use of an HRV or ERV. These products allow for balanced ventilation, same amount of air is exhausted as brought into the house, and the majority of the heat/cool is recovered from the exhaust stream into the incoming air. 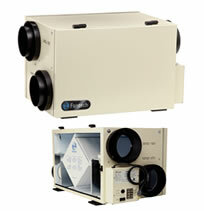 You get the best of both worlds — good air quality and low operating cost.